ARM’s key performance indicators cover both financial and non-financial elements of our business. Indicators for the preceding four years are included for comparison. The financial key performance indicators are based on segmental analysis and include all the ARM divisions. The definitions for the indicators are included where appropriate. HEPS increased by 10% from 1 735 cents per share to 1 900 cents per share. The increase in headline earnings was primarily due to a 68% improvement in the ARM Platinum contribution and a 17% increase in the ARM Ferrous contribution to headline earnings. Headline earnings comprise earnings adjusted for items of capital nature. This is then divided by the weighted average number of shares in issue to arrive at headline earnings per share. The segmental analysis EBITDA margin remained constant at 36%. The EBITDA was positively affected by a 17% weakening of the Rand versus the US Dollar and higher palladium prices. These were partially offset by lower US Dollar prices realised for platinum, rhodium, copper, nickel, chrome concentrate, ferromanganese and export coal together with higher than inflation cost increases at the iron ore, manganese, Modikwa and coal operations. The EBITDA margin is the segmental analysis earnings before interest, taxation, depreciation and amortisation, excluding exceptional items and income from associates and joint ventures, divided by segmental analysis sales. 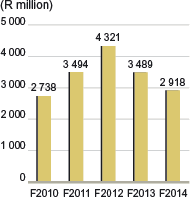 Segmental analysis capital expenditure attributable to ARM decreased from R3.5 billion in F2013 to R2.9 billion in F2014. The main capital expenditure items in the year under review related to the Lubambe Mine as it ramps up, equipment purchased for the Beeshoek Village Pit, waste removal at the East Pit, completion of the Khumani Mine Wet High Intensity Magnetic Separation (WHIMS) plant, modernisation of the Black Rock Mine and the recapitalisation of Modikwa Mine. A regrettable fatal accident occurred at Modikwa Mine during the year under review. The number of Lost Time Injuries (LTIs) decreased from 149 in F2013 to 106 in F2014. This represents a 29% reduction in LTIs. 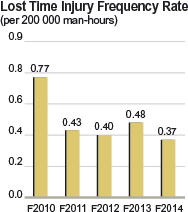 The Lost Time Injury Frequency Rate (LTIFR) reduced from 0.48 in F2013 (per 200 000 man-hours) to 0.37 in F2014. ARM has implemented an HIV & Aids programme in accordance with the primary aims of the South African National Strategic Plan for HIV, TB and sexually transmitted infections (STIs) of 2012 – 2016. In alignment with the National Strategic Plan, all operations have implemented integrated policies on HIV, TB and STIs. HIV counselling is offered to all employees who visit the site clinics but HIV testing remains voluntary, referred to as Counselling and Voluntary Testing (CVT). This has resulted in a 63.4% increase in the number of employees counselled. A standard TB reporting tool that includes workplace investigations and compulsory TB screening for those in contact with TB infected employees at the workplace, has been implemented as required by the DMR and the DoH. 35 746 employees and contractors were screened in F2014 (F2013: 18 995) and 119 new infections have been reported and are on treatment (F2013: 141). 118 cases have been cured while 14 cases of multi-drug resistant TB (MDR TB) have been admitted to MDR TB hospitals for treatment. The number of employees registered on Disease Management Programmes has increased by 86% from 645 to 1 202. ARM has again been certified as a Top Employer by the CRF Institute and has improved four positions from last year. Progress continued in EE, including gender diversity. 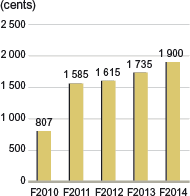 The Company’s overall employment equity performance is ahead of 2014 Mining Charter targets. The percentage of female employees remained at 15%. There has been an increase of almost 2% in female middle management which reflects positive career progression from junior management. The Company spent 8.7% of payroll on training (F2013: 10.1%). During F2014, ARM spent R142 million (F2013: R100 million) in terms of Social and Labour Plans (SLPs) and Local Economic Development (LED) and R135 million in terms of Corporate Social Investment (CSI) (F2013: 62 million). In addition R6 million was spent (F2013: R7 million) on projects to uplift and benefit rural communities. 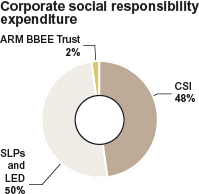 Total Corporate Social Responsibility investment was R283 million compared to R169 million in F2013. This includes R95 million CSI expenditure in Zambia by our Lubambe Copper Mine. ARM has determined its carbon footprint and has made a submission to the Carbon Disclosure Project (CDP) for the fifth consecutive year. Our CDP submission for F2013, which was submitted during May 2014, was successfully externally verified for the second time. A disclosure score of 96% in 2013 and a “B” performance score.